It sounds like your test was a success, that always makes you feel a little better about your design. Yes it was, and the charcoal basket I used was just under 2/3 the size of the one I will be making for it. That should up the cook times quite a bit. Lighting it evenly across the top it still burned from the center out like I thought it would. After opening it all up and pulling out the basket I still could not hold my hand on the CC after three hours that thick steel really holds the heat. I have been mulling it over and I think I have decided to mount this smoker on the tractor seen in this photo. 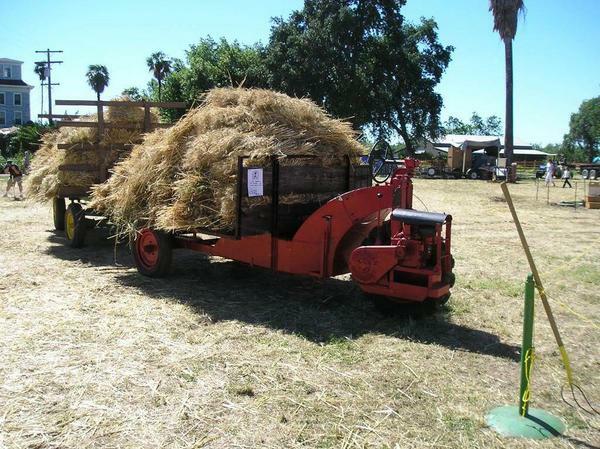 The tractor is a very very rare English tricycle that was used to haul hay on a relatives ranch. My plan is to mount the smoker sideways just ahead of the rear tires. I will pull all the decking and headboard off and set the smoker down on the lower frame rail. 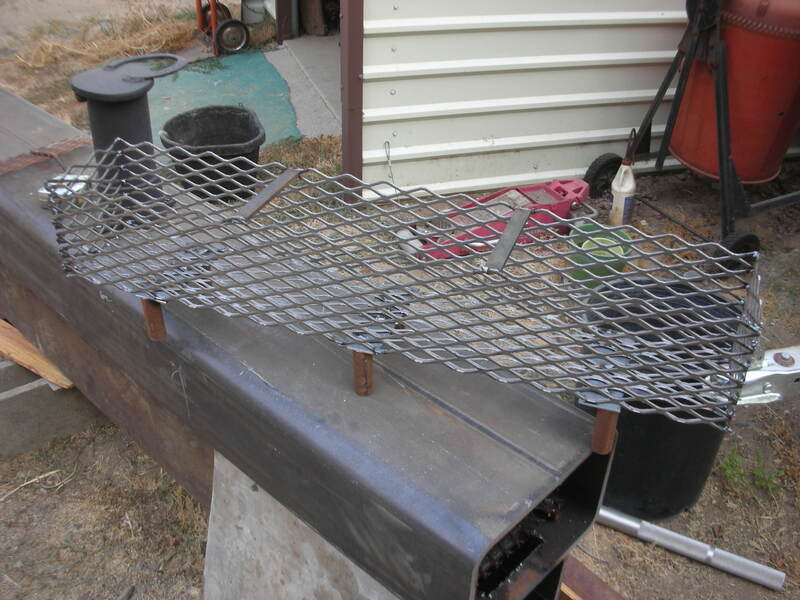 I will have to cut the upper bed support and then weld the smoker in place. I will also add my gas grill, my small smoker, a turkey fryer burner, and try to find a hot plate for pancakes. A little sink with water would be nice too. If I plan it right I can build a cover for it with sides that fold up for shade. The tractor is an Opperman Motocart. It's a front wheel drive single cylinder machine. The bed wood is rotten and needs replaced anyway and I don't use the thing anymore as it's 16' long and a lumbering pain in the arse to move around. It has been in a once a year parade for the last few years and this idea would bring new life for it. I don't plan on going into any sort of business and hauling this big thing around won't be as simple as a little trailer smoker. I still think it's too good of an idea to pass up. I have 10+ feet of length to play with and the big tube smoker is only 1' wide so that leaves lots of room for other stuff. There will be 5' of space in front of the smoker and 2' behind the rear tires. I will have a counter of some sort over the tires. With everything mounted low it will be stable and usable from the ground. I would not be ruining the tractor and it would give it new life......what do you think...crazy or not? Very interesting tractor that. I'd say go for it. This will be an even more interesting build thant the center feed tube build. It'll definitely be one of a kind! How reliable is the tractor? If it craps out on you, mobility becomes a real issue. I hate to spend time fixing one thing just to use another....in this case, the tractor in order to move the smoker so I can cook next weekend. Other than that, it definitely has potential for an interesting build. The tractor is reliable but not an easy one for most people to start and drive. I would park it where I can use all the bbq's without having to move it. The negatives to using it are it's big, it takes a large trailer to haul it, I have no real need for a rig that size, and I'm not looking to cook for a large group very often. Positives are it's a perfect platform to mount all the bbq's on, it has the cool factor, it would be one of a kind, and it gives me a reason to keep the tractor in good shape. All good except I cannot sell the tractor....it's a long story. All good, I was just adding to the thoughts to be considered, rejected or refined. In which case it's the tractor or an alternative trailer. If you were never going to move it off the property, or very seldom. I would use the tractor. If it is more than the occasional trip to somewhere else for the BBQ wagon, then I'd build a smaller, easier managed trailer. But like you said, wait until the tube smoker proves its worth before going off at a tangent and sinking bucks into a project. It is 3' long and 6" wide by 6" tall. It stands 3" off the bottom and should give me enough room for an 8 hr cook time. The weather is turning cooler and I got to looking at the smoker and realized it would be real easy to prep it for paint as it sits. If I waited longer it will rain and start to rust up and that means more work prepping it. So, I hit it with steel wool and gave it a coat of BBQ paint. I'm liking the glossier paint on it so once the thing is complete I will pick out a high gloss high temp paint for it. For now I can keep building onto it and touching up the bare spots as I go to keep my final prep to a minimum. Found a deal on Craigslist today and if things work out I will post a picture of my free find......I just hafta wait to make sure it's still available in the morning. They are supposed to hold it for me but free usually means first come first served. If I can get this it will make the decision on what to mount it on pretty easy. 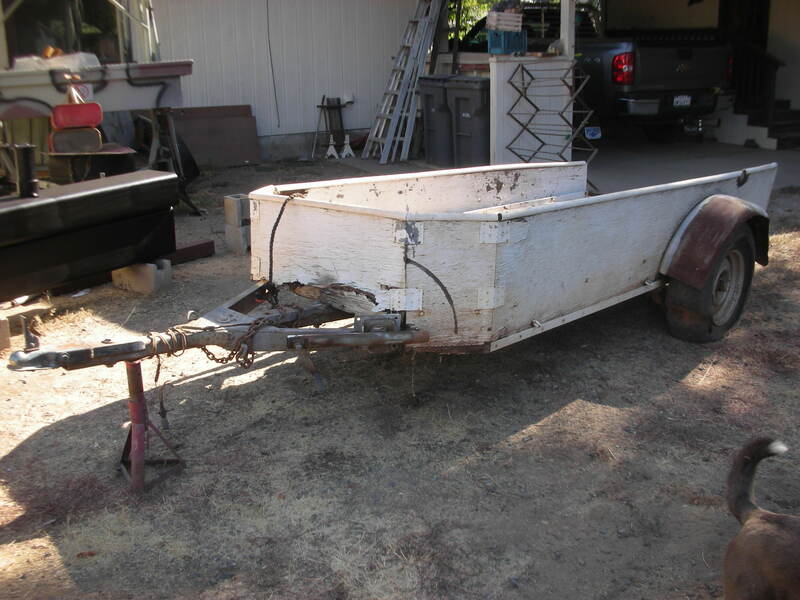 I made a craigslist score and got this trailer for free. The wife already wants to steal it and have me make it into a utility trailer for her. I am not sure how I want to mount the smoker or just how I want to cut the trailer down......too soon to tell. 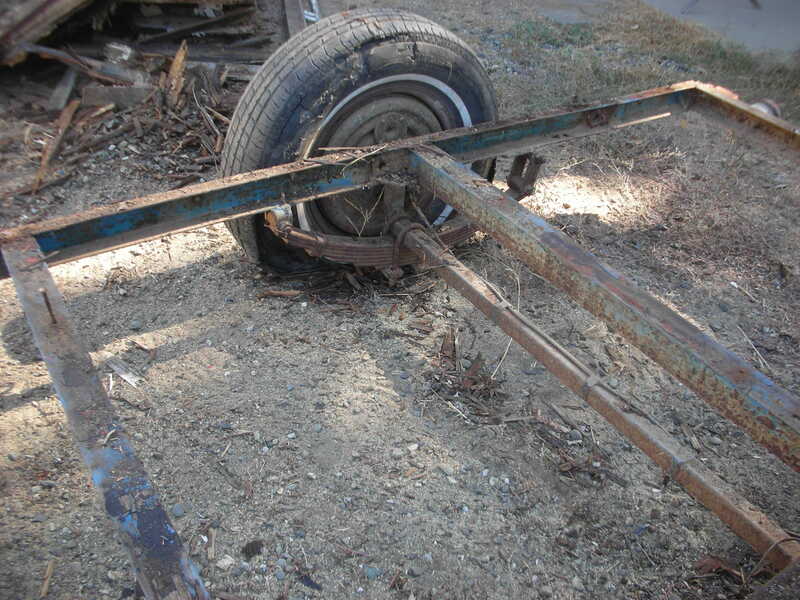 This trailer has a good set of springs under it and it even has brakes. I will have to tear into it and see if those brakes are any good and if they are I will hook them up. Decisions decisions......built it for the wife or use it for the smoker.......??????????? Wait, I was looking forward to that tractor smoker build. It was sure to be the first of its kind. We've had a lot of unique builds as of late, but that one would've been a show stopper. It ain't over till the fat lady sings.........all options are still on the table....................but, a trailer rig is what I really wanted. I'm all over the map at times so buckle up and hold on, it's going to be a bumpy ride..
Lol. Same here bro. Sometimes I wonder how I ever get anything done. I studied and measured this frame all day and the fact that the front half is bent upward and all the angle braces are uneven and bent I came up with the only option that will look good and be straight. 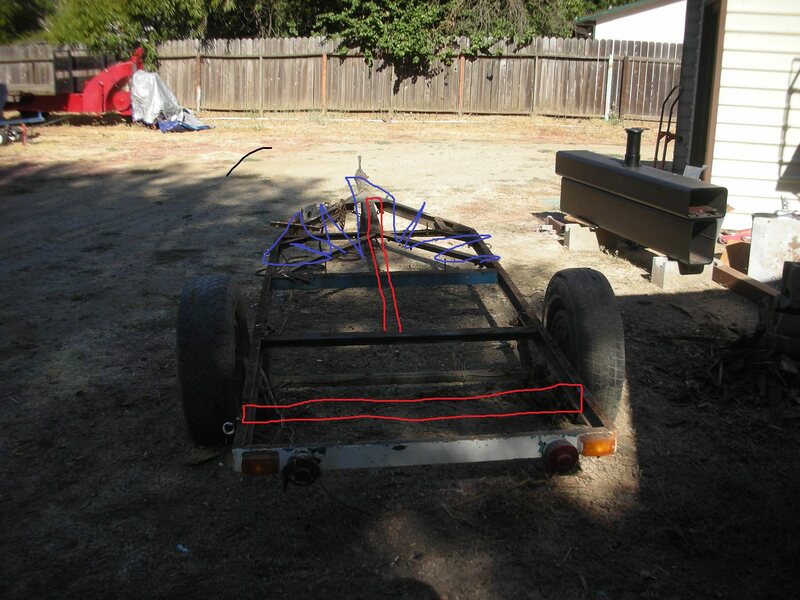 I will cut the back one foot or so off the frame and get rid of a bad splice and get the axle where I want it in relation to the rear of the trailer. I will cut the frame off in front of the cross member that is ahead of the axle. The rear cross member will be flopped around and welded into the front of the frame. I will then stub in a new tongue shaft back to the axle. All the blue area will be cut out and a new cross member put in at the new rear cut off point. There is just too much clean up to do on all the existing tongue area. I'll try and keep the little tongue jack and figure out where to mount a spare later. I pulled the hubs off and one side has good brakes with only a couple springs that need replaced....the other side is wore out and a bunch of parts are missing so I will be pulling the backing plates off the axle and stripping as much off the hubs as I can and it will not be getting brakes. I should be able to salvage the fenders so that is a plus. It always helps to have a good plan and it sounds like you have one. One?.....more like ten every day I change my mind a bit but always go back to the basic plan of a simple build. Finding this trailer helped me stay focused on the original idea. I'm not going to cut on the trailer until the smoker is finished and tested though. I’m throwing out plan “c” but why not just cut off the axle and spring packs, scrap the rest and build the trailer you need from scratch? Sounds like you are going to spend a lot of time fixing a wore out trailer. One thing I’ve learned over the years is “free” is not always free. I thought of that as my first option for this trailer. Then I studied it a bit and realized I can make it into the trailer I want with what is there. I have modified my plan a little since last night and will be using the existing tongue portion but cutting out the section behind it.The tongue will end up being the structural weight bearing part under the smoker from the axle forward. I started to design the whole thing last night with storage box's, prep surfaces, another bbq on the side, etc. Then I stopped myself and decided to leave all those options on the table but just plan for the first stage of the build and that is getting the trailer pared down. Stage two will be getting the tube smoker on the trailer where I want it to be. From there I will work on adding everything I want to go with it. I do have a plan in my head for a new trailer frame/ design that is very minimalist in design if I change my mind and want to go for a different look. Nothing is set in stone at this point. I was out of town for a week and had time to think about this project. Putting the smoker on the tractor is now officially off the table. I don't want to build something that big. Cool or not it's out. I have settled on two options for the trailer rig and need help deciding. Option one......use the smoker as the frame of the trailer and make it all as small as I can with a folding tongue. I can fit in a prep area and maybe a small grill on the side. The spare tire would have to be a donut and mounted underneath. A nice compact package. Option two. .....an 11' long trailer with room for two grills plus the smoker and large prep area. Lots of storage space and room for a full sized spare tire on the tongue. I am liking the looks and size of option one and if I get creative I could probably build a charcoal bbq for steaks and burgers on one side. Space for storage would be smaller than ideal but doable. I'm kicking this out there because I want feed back. I did get all the brakes off the axle today and my tire and wheel options are wide open now that those big brake drums and backing plates are gone. The main smoker is going to weigh 800 pounds by it'self and adding too much to this rig will get the weight up pretty high pretty fast. I don't want to go over 2000 pounds total on the bigger trailer option and the smaller option would weigh in around around 1100 pounds max.